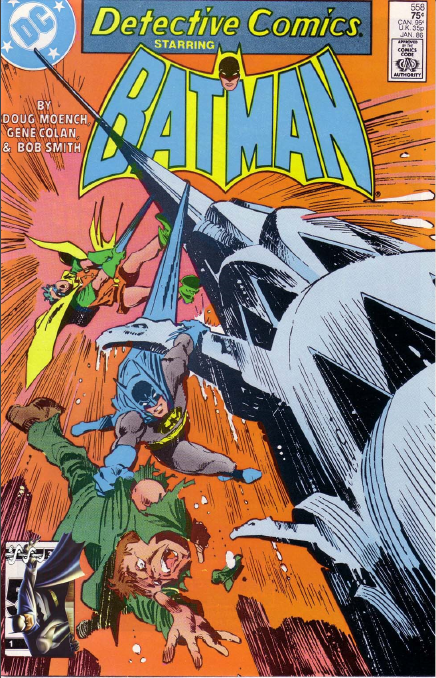 The red rains buffet Gotham in Detective 558 (Jan. 86), as the Crisis stories come to a close, and a number of people hunt for Nocturna. 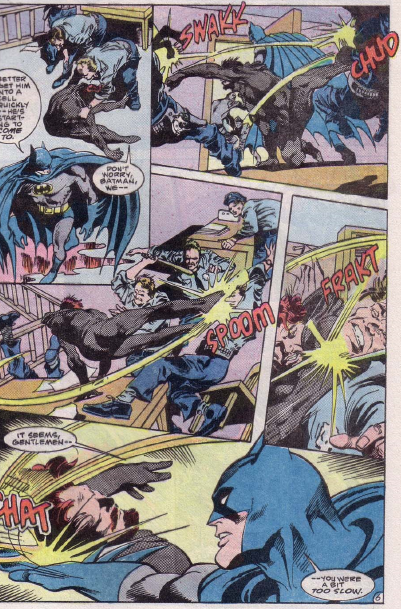 Batman brings the Night Slayer’s reign of terror to a close, finally. 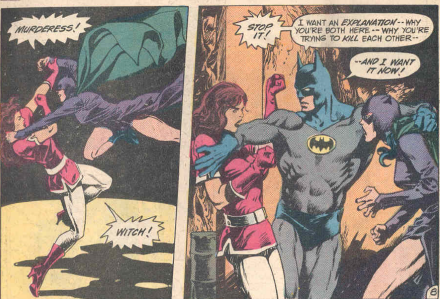 But Moench and Colan spend far more of this story on the night watchman seduced away from his wife by Nocturna, who roams the city searching for her, as does Robin. 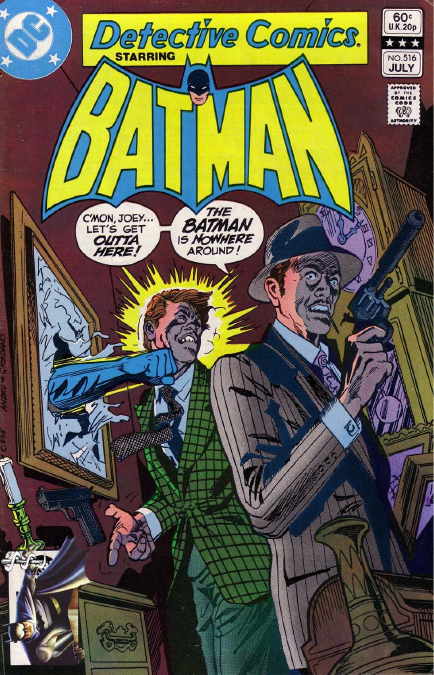 Harvey Bullock is also on the hunt, though the watchman himself is Harvey’s goal, after meeting his tormented wife. 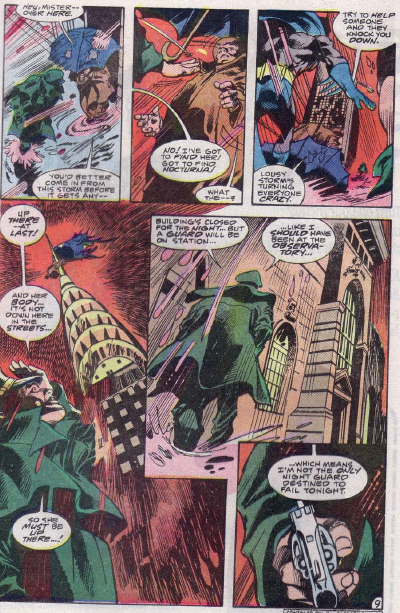 Seeing Nocturna’s damaged balloon hanging from the spire of Gotham’s version of the Chrysler building, he climbs to the top and sends it flying away. 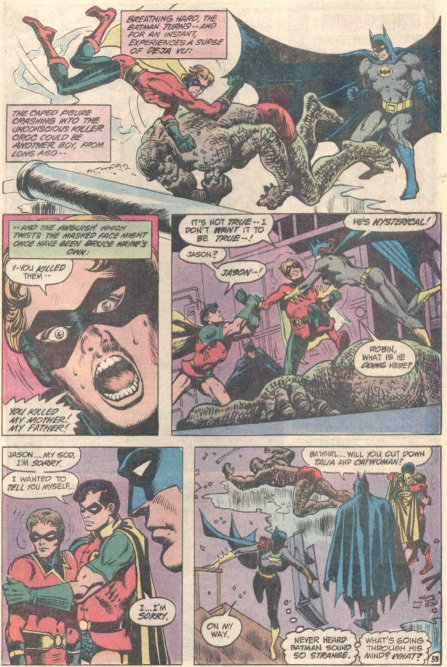 Although Batman and Robin try to save him, he falls and disappears into the red rains, and Bullock is left to try to explain things to the man’s wife. 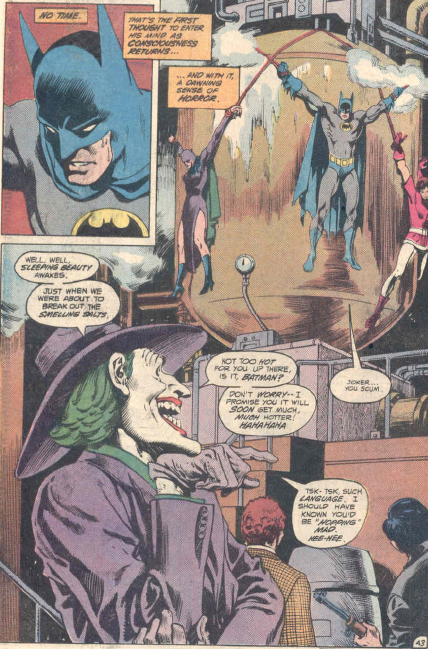 The story ends with Batman being called by Commissioner Gordon about the Joker’s escape from Arkham, which leads Batman into the pages of Crisis on Infinite Earths 2. 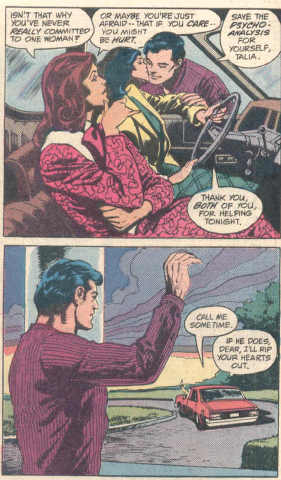 But not before he and Catwoman profess their love again. 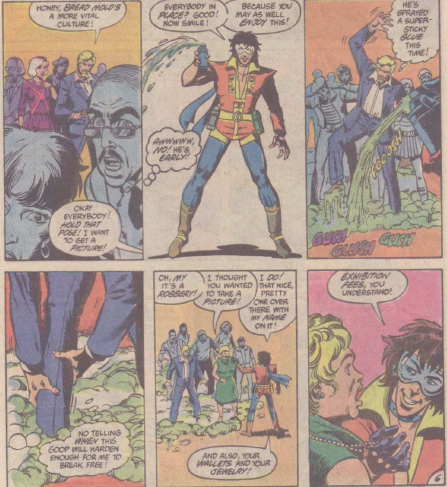 Dean Traven and Trevor Von Eeden helm this entertaining little story. 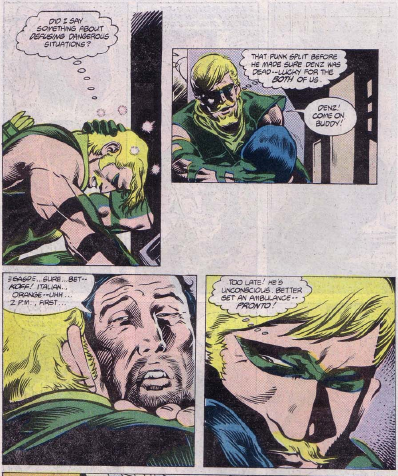 Green Arrow hears the words of a wounded man just before he passes out, and, interpreting them as a clue, seeks out those who attacked him. 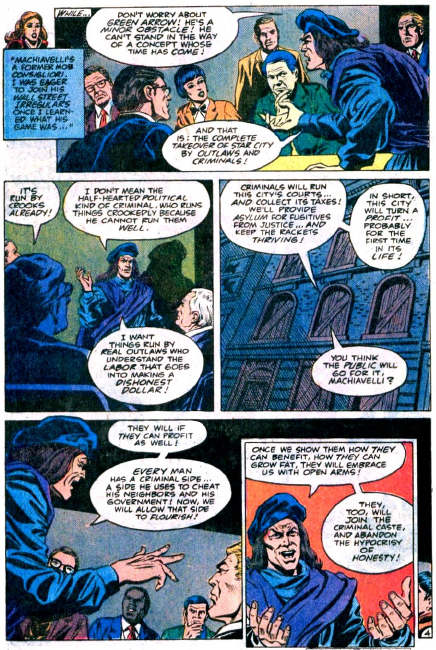 By far the best page of the story is a bit of a digression. 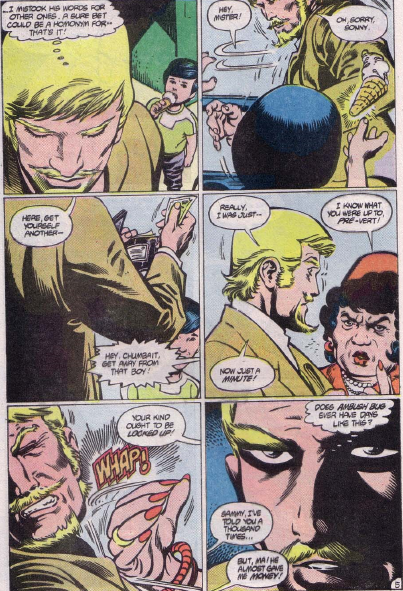 Olive spills a child’s ice cream, and when he tries to pay for it, is attacked by the boy’s mother as a molestor. 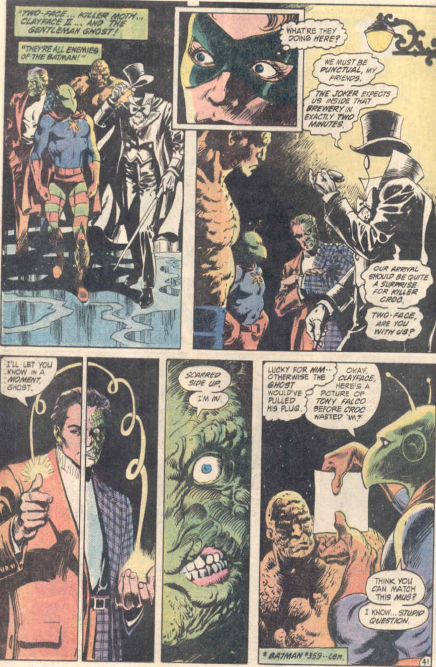 The page almost feels like Giffen, and the Ambush Bug reference makes me certain that was the intent. 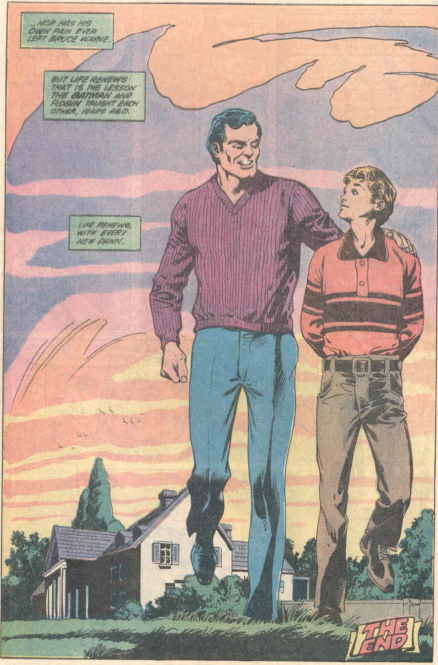 The ending brings a laugh as well. 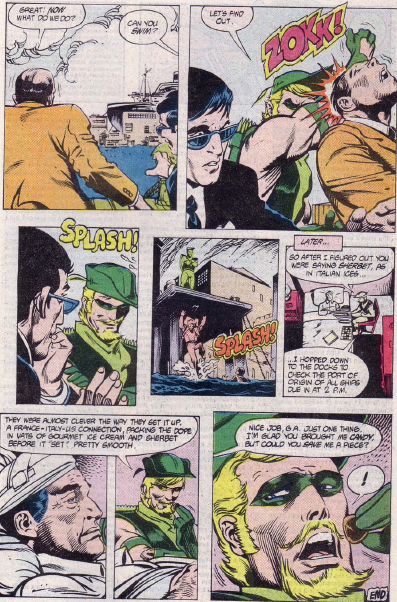 Green Arrow visits in the man in the hospital, explaining his mistaken interpretation of his words, and how he really found the attacker, all the while devouring the man’s candy. 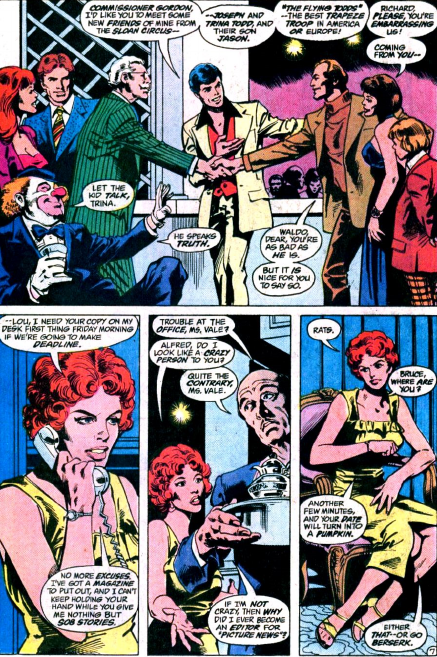 In Detective 533 (Dec. 83), Doug Moench and Gene Colan give Barbara Gordon her best, non-costumed, role to date. 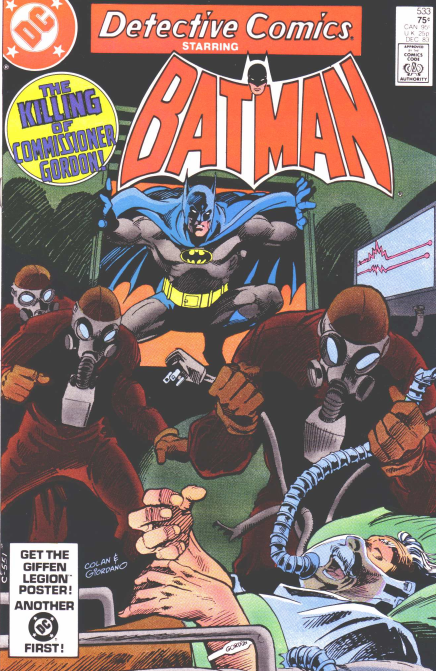 Commissioner Gordon is in the hospital after suffering a heart attack a couple issues earlier, in the pages of Batman. 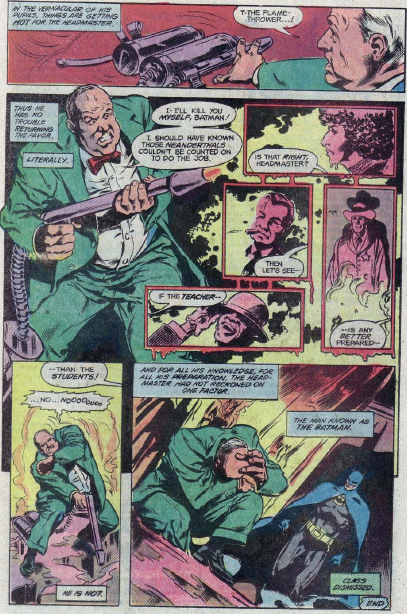 It was brought on largely by thirty years of smoking cigars, but happened while he was arguing with Harvey Bullock, so Bullock blames himself. 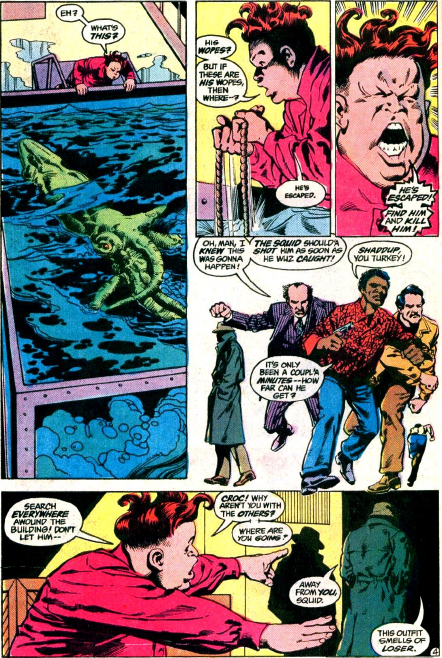 Four ex-cons decide to invade the hospital and murder Gordon. 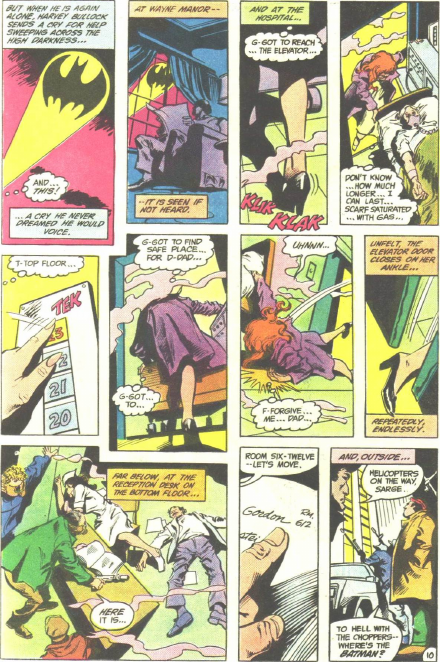 Barbara contacts the police, who alert Batman, but spends much of the story hiding her father, and doing her best to keep him safe and alive. 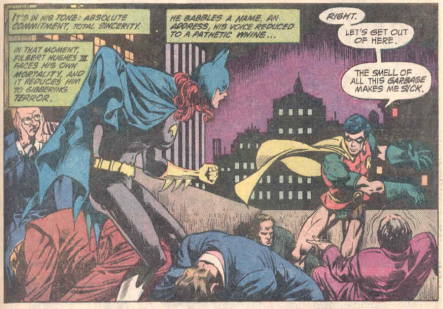 Yes, Batman beats them up, and Bullock helps as well, but Barbara is the unsung heroine of the story. 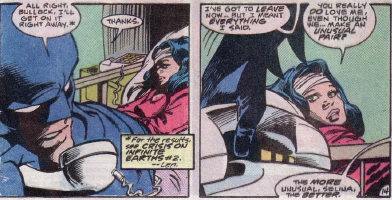 It’s kind of sad that she is given far more emotional and impressive action in this story than she had in her own back-up series. 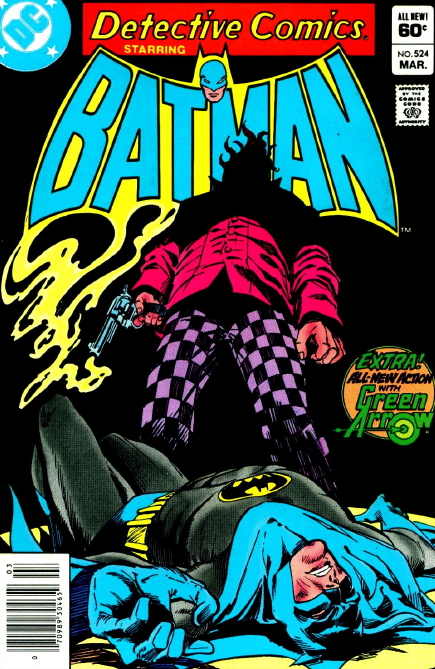 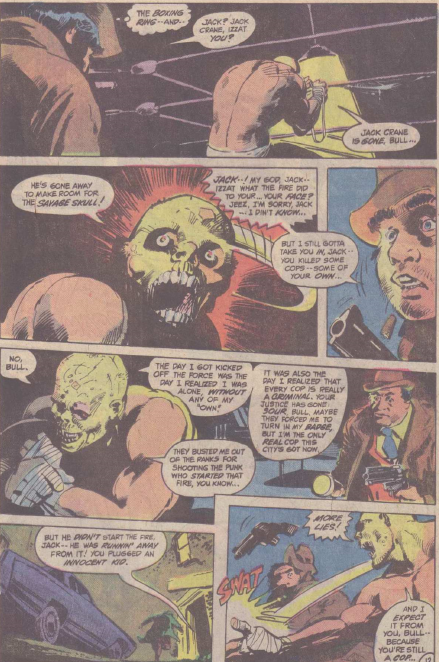 Doug Moench continues the return of the Savage Skull, the cop killer who had only appeared in Batman up to this point, in Detective 528 (July 1983), with art by Gene Colan and Klaus Janson. 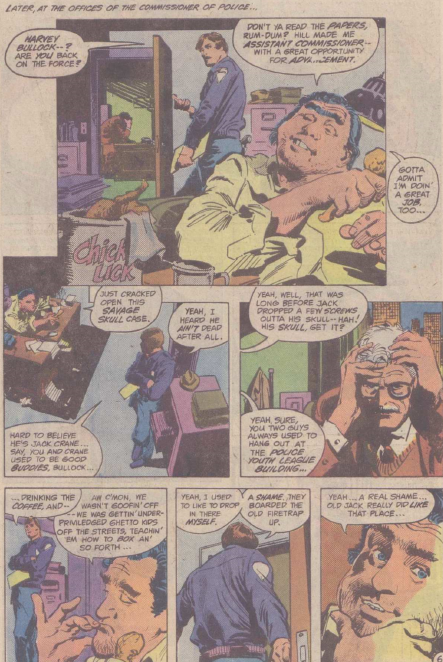 Mayor Hamilton Hill brought Harvey Bullock back onto the force in the last Batman, and Commissioner Gordon goes to complain to him in this story, not realizing that the reason the mayor brought Bullock in was to annoy Gordon. 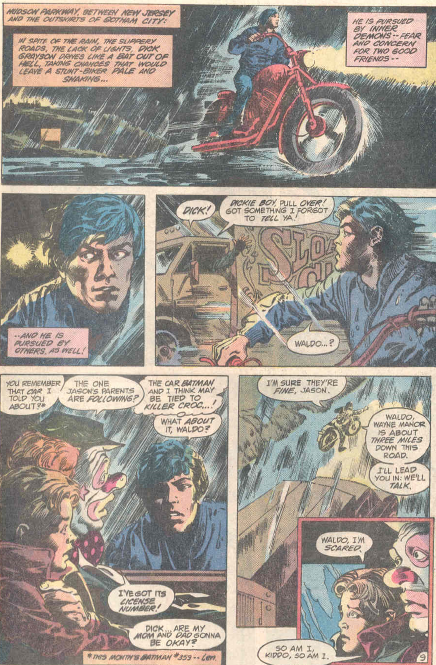 Bullock is quite a bit different than his first appearance in these pages in the mid-70s. 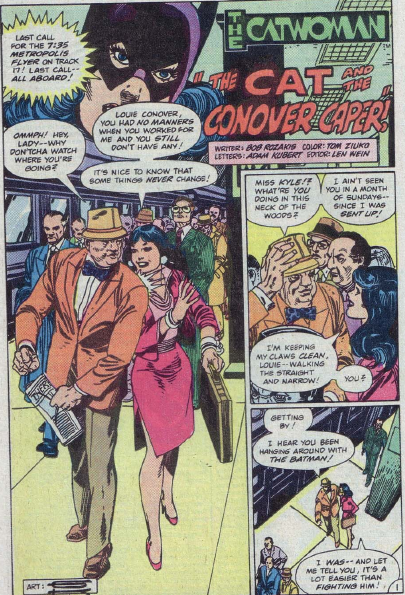 While his anti-Batman attitude is intact, he is slovenly, and does not appear a completely honest cop. 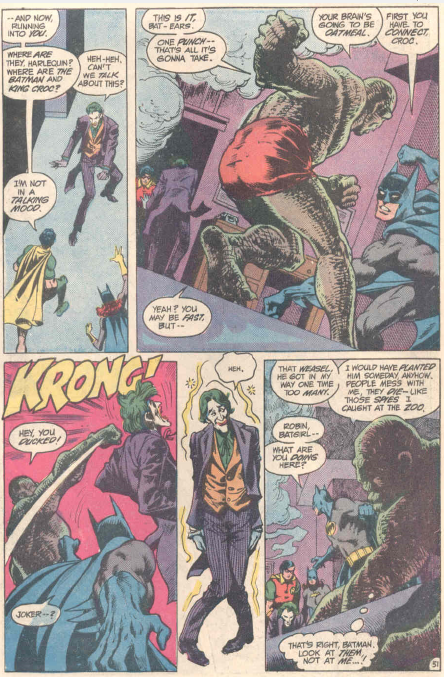 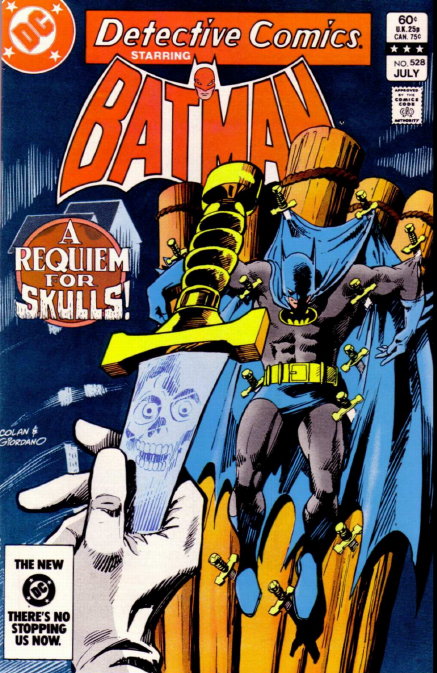 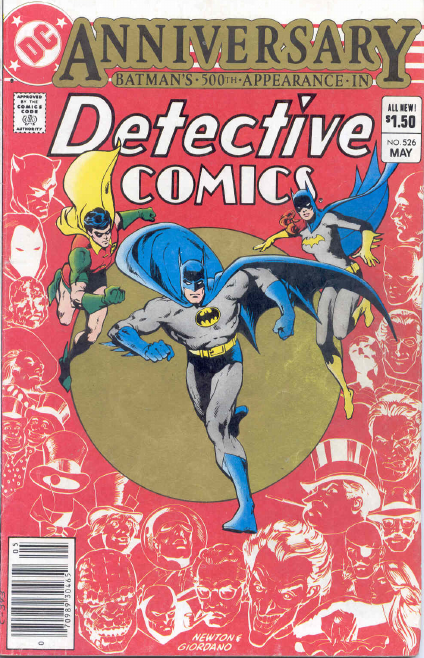 The mayor’s task is made easier when more dead police show up, despite Gordon, and Batman, insisting the Savage Skull was dead. 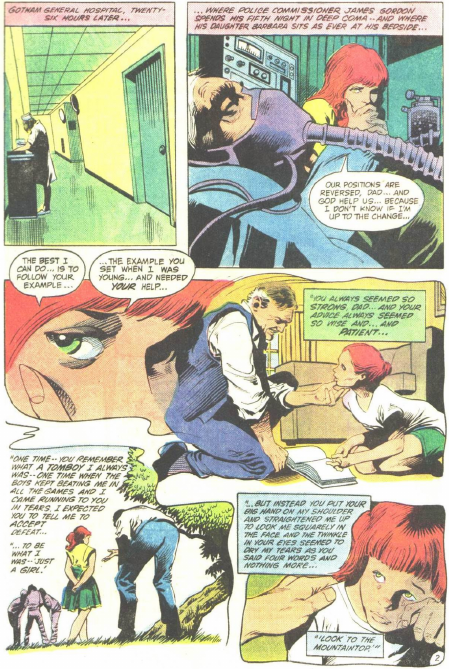 Harvey goes to track him on his own, and finds the killer. 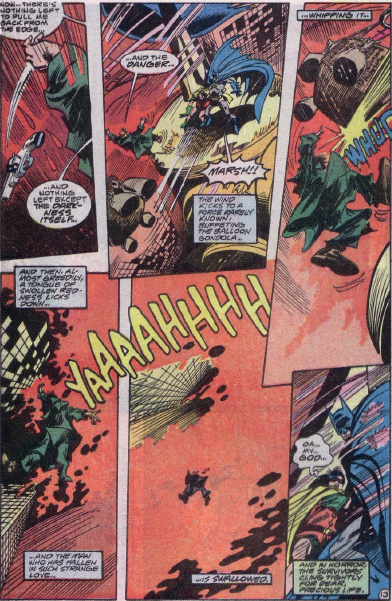 Harvey is almost killer by the Skull, but Gordon intervenes and saves him. 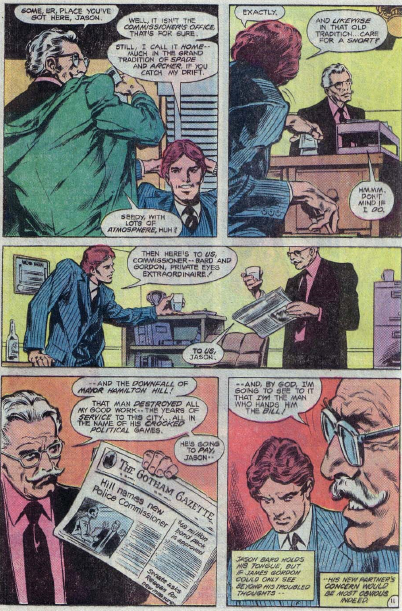 Gordon had not trusted Bullock, and had been following him. 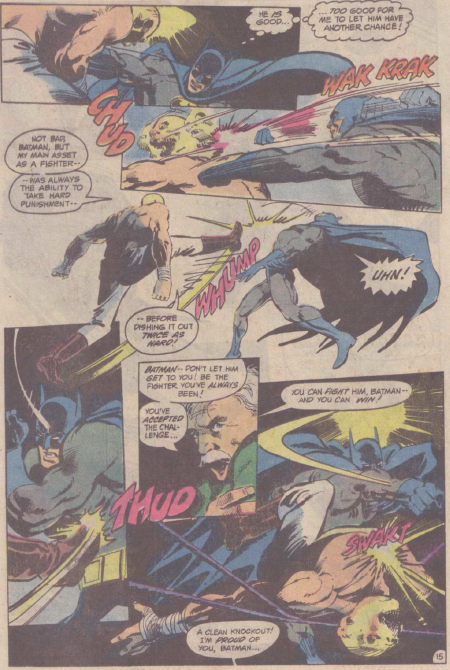 Batman also shows up, on the trail on his own, and defeats the Savage Skull. 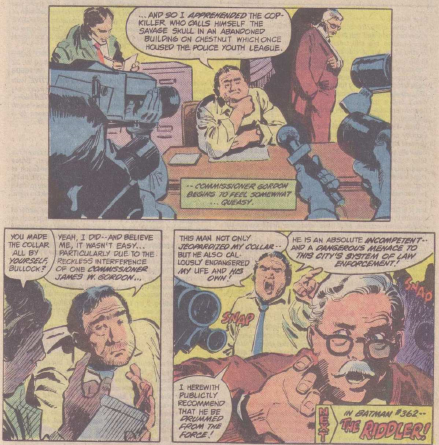 Things seem patched up between Bullock and Gordon, until Bullock holds a press conference, lying about the capture of the Skull and denouncing Gordon. 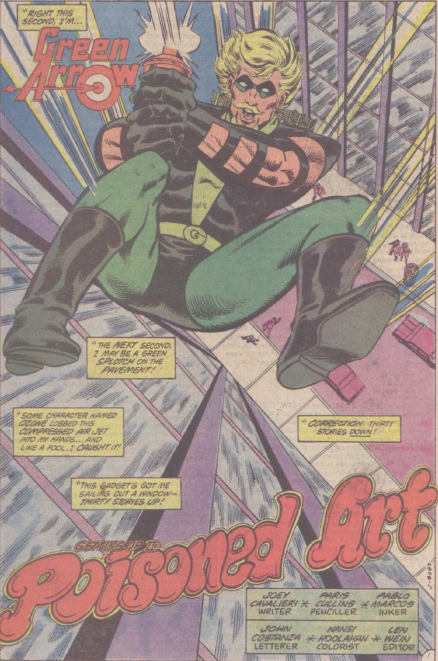 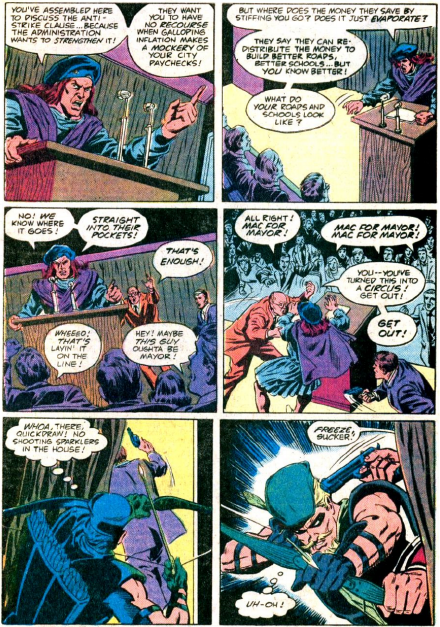 Green Arrow shoots his way out of this deadly situation with a rope arrow, thanks to Joey Cavalieri, Paris Cullins and Pablo Marcos. 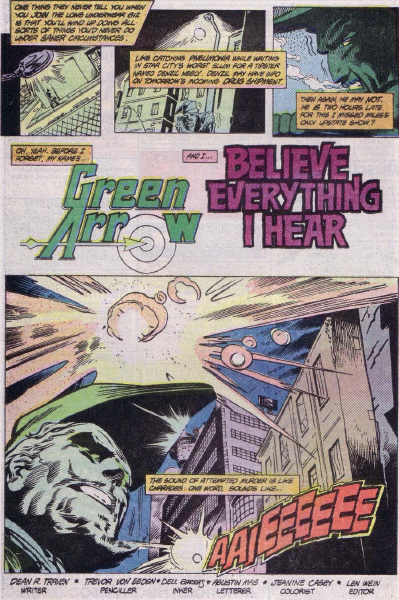 Green Arrow discovers that Ozone is somehow connected to a secret government science agency, Z.Z.Z. 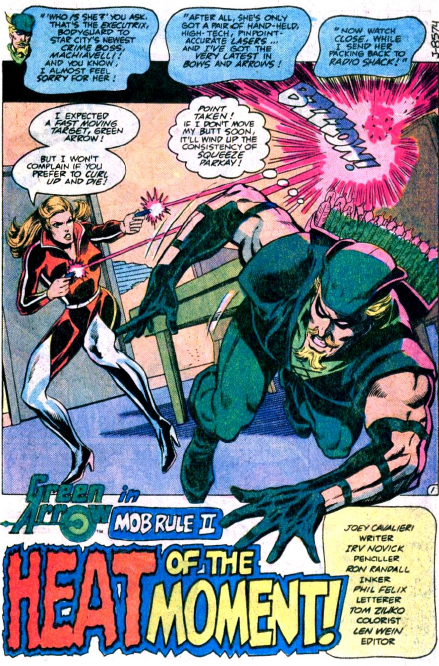 Rick knows more about this organization than Oliver, although how much he is connected is not clear. 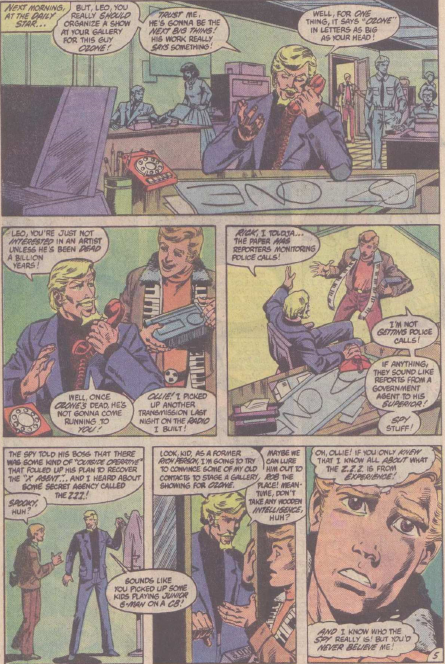 Ozone continues on his merry way, stealing at will. 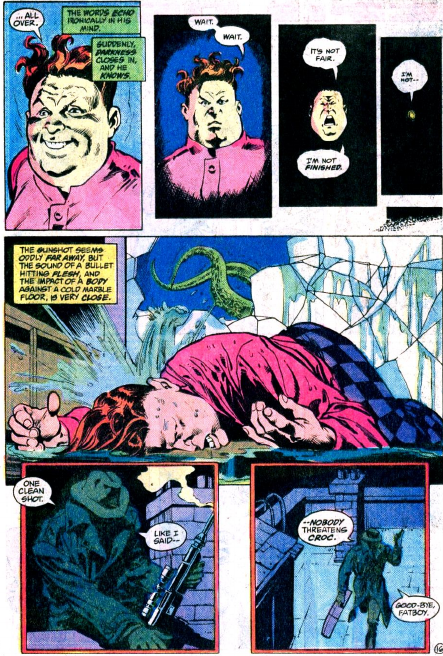 The story does continue. 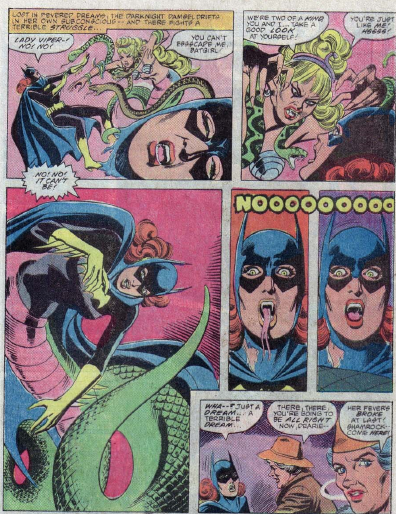 Just in case you thought it ended that way. 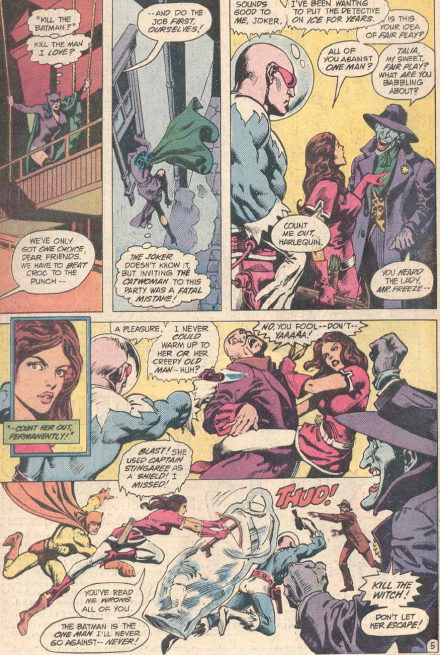 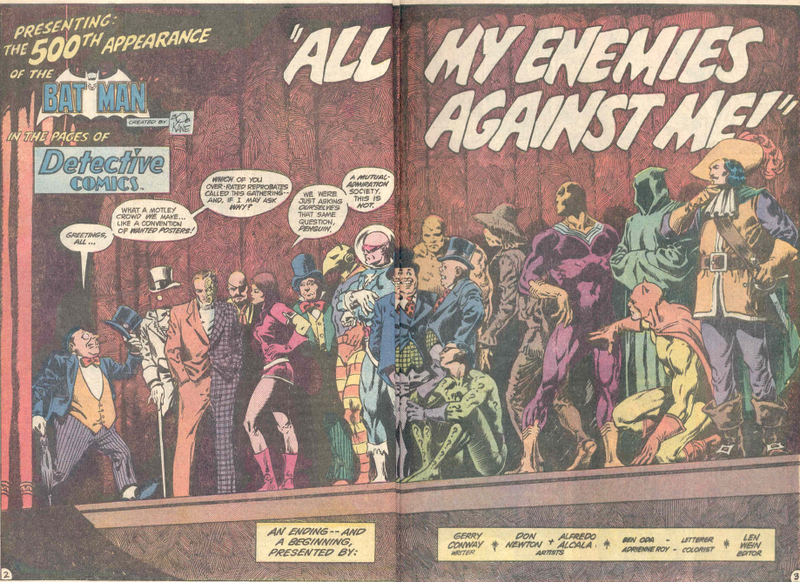 Gerry Conway and Don Newton art joined by inker Alfredo Alcala on Detective 520 (Nov. 82). 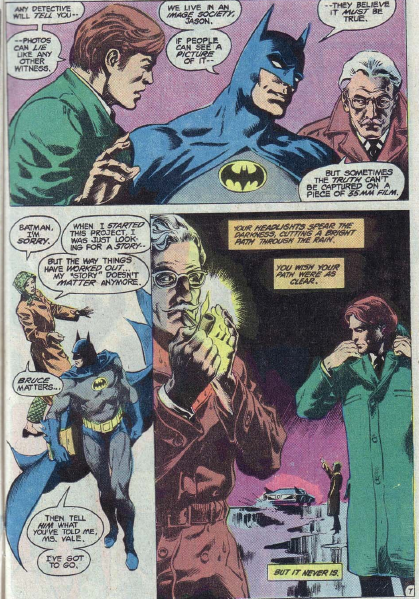 Batman meets with Jim Gordon and Jason Bard, as well as Vickie Vale. 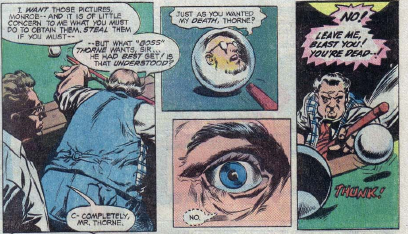 Her editor committed suicide, and they know he gave Vicki’s pictures to Boss Thorne. 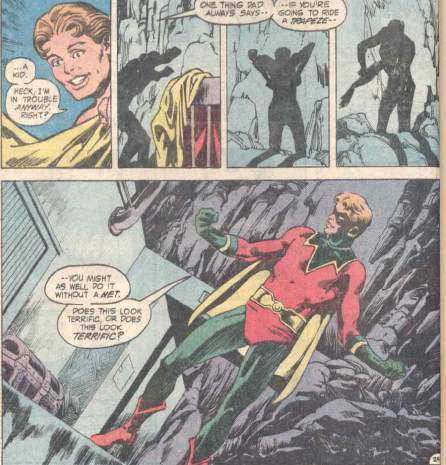 They are trying to tie Thorne to Hamilton Hill. 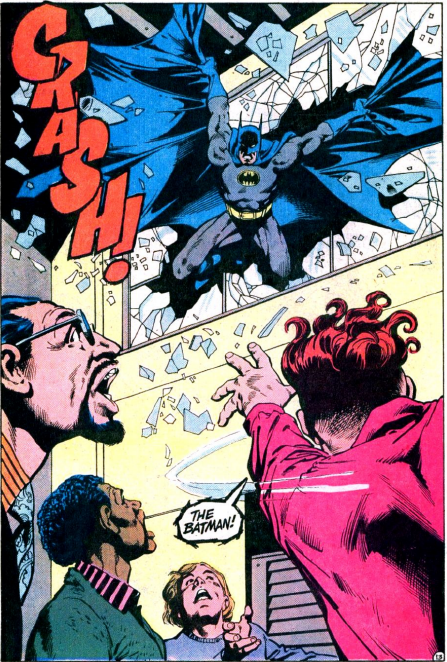 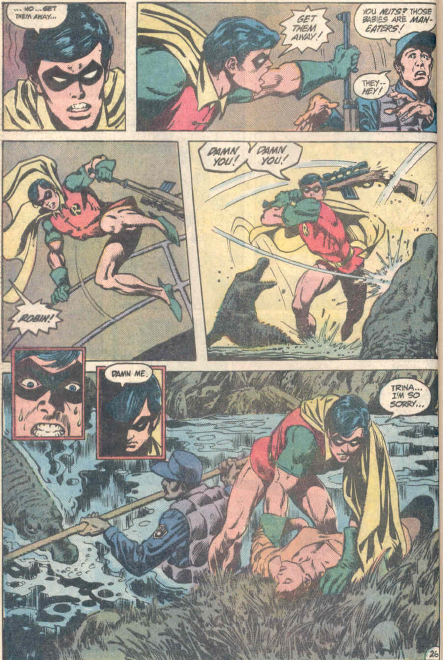 Batman breaks into a prison, and breaks Deadshot out, to get the name of who hired him. 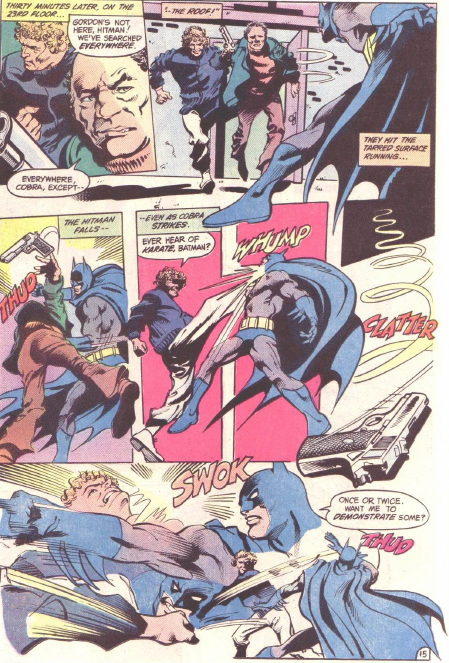 Floyd Lawton has no problems giving up Thorne’s name, but is surprised when Batman knocks him out and sends him back. 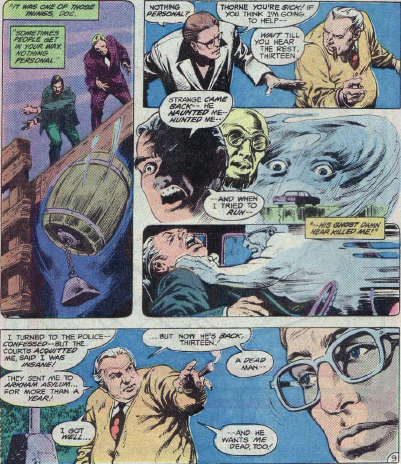 Meanwhile, Boss Thorne is more concerned with the hauntings of Hugo Strange’s ghost than with the detectives, and has hired Dr. 13 to find out if the ghost is real. 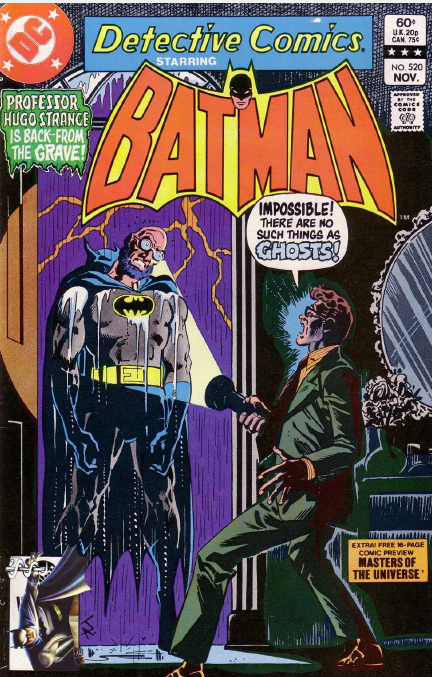 Dr.13 was last seen a little over a year earlier, investigating the ghost of Wayne Manor. 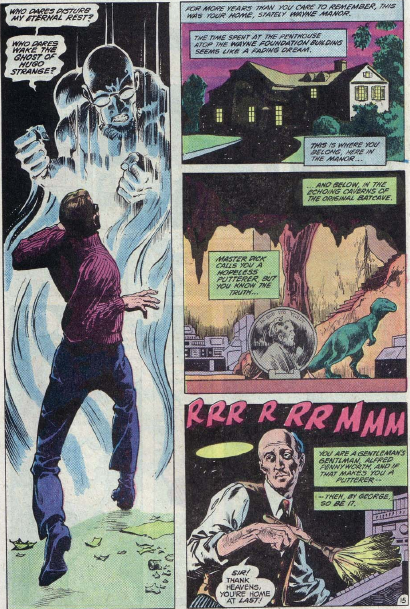 Dr. 13 goes to Greytowers, the phony hospital run by Hugo Strange, and his ghost materializes. 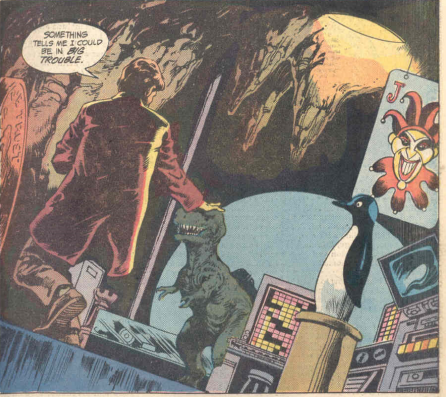 And Alfred dusts the Batcave. 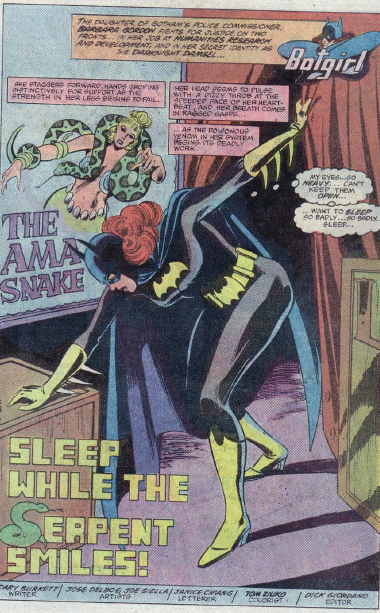 Catwoman’s solo tales had been running periodically in the back pages of Batman for the last few years. 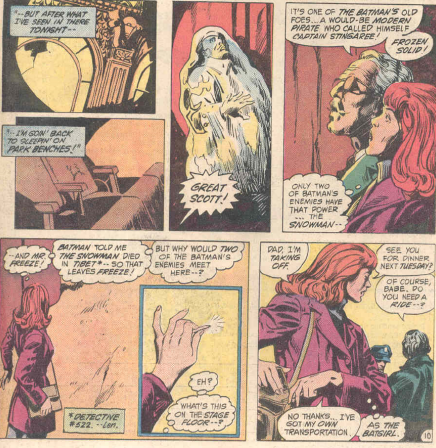 This issue marks her only solo story in Detective, by Bob Rozakis and Gil Kane. 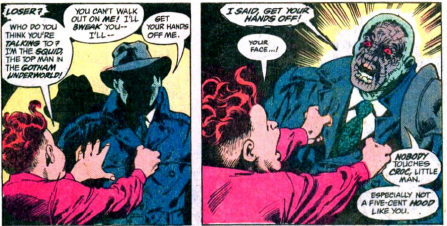 Selina Kyle bumps into a former henchman of hers, and, sensing that he is lying to her about his plans, decides to follow him. 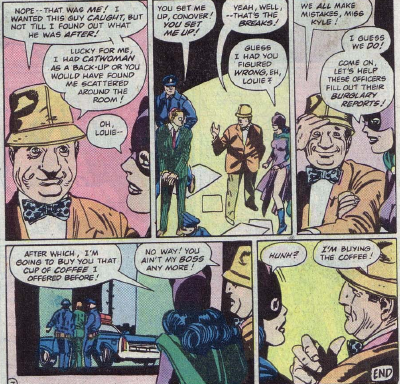 Catwoman is on the good side of the law these days. 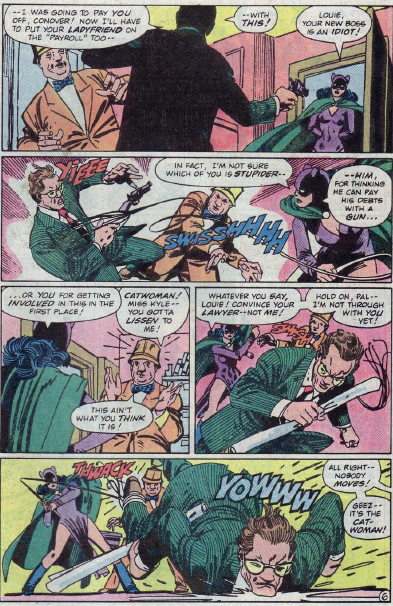 It’s a soft story with a happy ending, as the guy has gone straight as well, and was hoping Catwoman would follow him and be his back up as he exposed some thieves.